Earlier this week, Sports Illustrated magazine named the Golden State Warriors as their Sports Person of the Year. They are the fourth team to be recognized with the honor, following the 1980 U.S. hockey team, the 1999 U.S. Women’s World Cup soccer team and the 2004 Boston Red Sox. “Our success is due to the contributions of every single player, coach and staff member in our organization; for Sports Illustrated to recognize this unique dynamic is truly special,” said Warriors President of Basketball Operations/General Manager Bob Myers upon receiving the notice of the honor. 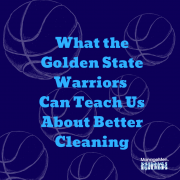 In an industry such as ours, which is notoriously filled with inefficiencies, it can be beneficial to look to a successful organization like the Golden State Warriors for inspiration and ideas to improve the way we operate. One thing that stands out about the Warriors is how they are a team, both on and off the court. Everyone makes sacrifices and while there are star performers, each individual fills a very specific function within that team dynamic. A lot of custodial operations operate use an individual-based approach, rather utilizing than the collective strengths of the team. This is called zone cleaning. 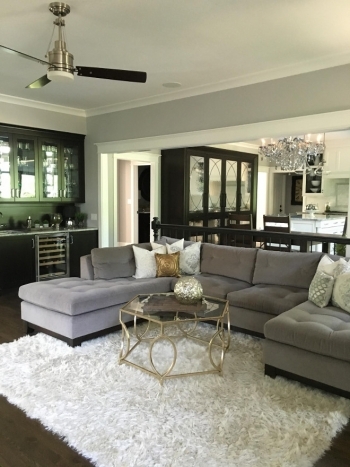 Within this type of system, individuals are assigned to clean a specific area, performing all of the cleaning responsibilities within that space. So, a janitor might be required to dust and mop eat floor, empty trash, wipe down/disinfect surfaces and fixtures on the first floor of a building. If the Warriors’ coach Steve Kerr were to apply that to his team, you can only imagine the results. At six foot three inches tall, Steph Curry is too small to play center and would never be effective under the basket. He’s a talented ball handler and shooter, which makes him better suited for a point guard or shooting guard position. When you apply a team-based approach to cleaning, each individual has a specific job, much like the players on a basketball court. For example, a “vacuum specialist” vacuums all the surfaces throughout the building and checks that wastebaskets have been emptied. It’s much simpler and faster to train employees to perform those two tasks than it is to train them on a long list of jobs. Yet the advantages go beyond training. The biggest advantage of team cleaning is improved productivity. Let’s say that you have to clean a 12,000 square foot building with eight floors. 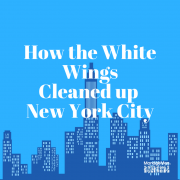 If one worker was assigned to each floor, performing every cleaning task over a four-hour period, it would require eight people, eight vacuums, eight trash barrels and eight restroom carts for the entire building. In that same building using a “specialists” approach, a light-duty specialist and vacuum specialist would be assigned to the first four floors, and another identical pair of specialists would be assigned to the top four floors. A restroom and utility specialist would be assigned to the entire building. Using this approach, only six people, two vacuums, two trash barrels and one restroom cart is required. There are several things which experts attribute to the overall excellence of the Warrior’s legacy. This includes the versatility of its players, their skill, the number of great players on the team, their unselfishness and the respect everyone within the organization has for one another. Rise or fall, the team does so together. These attributes have led the Warriors to three NBA championships in the past four years, losing to the Cleveland Cavaliers in the 2016 finals. Just like the Warriors, everyone on a team cleaning team is responsible for the success or failure of their team. And as a result, they are stronger—and more effective—together. * For more information about team cleaning or to find a variety of resources designed to improve the way you set up and manage your team cleaning program, please click here. If you don’t read the Harvard Business Review, you may want to check it out. While there’s only a limited number of articles you can read each month without a subscription, they always offer great insights and ideas to help you become a better manager. “How to Mentor Someone Who Doesn’t Know What Their Career Goals Should Be” by authors Tania Luna and Jordan Cohen was featured on HBR.org earlier this week and it really resonated with us. So often, custodial managers tell us that they struggle to get staff excited about the work we do. Some people see a gig in custodial like the game “hot potato.” As soon as they get in the position, they want out. But a lot of times, these people don’t even know what they do next. The fact that the U.S. is experiencing an increasingly tight labor market with tougher immigration policies doesn’t help either. 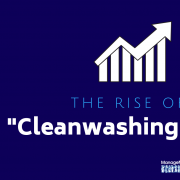 While not widely addressed in our industry at this point, these conditions can lead to that labor shortages that will continue to plague cleaning departments everywhere. 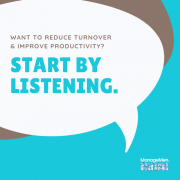 That’s why it’s important that we look at our teams and help them build useful skills that may not only transfer to other areas within our businesses, but also help them more clearly see the longer-term impact of their work in custodial. 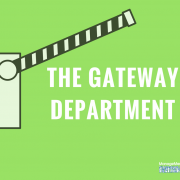 Often, custodial is looked at as the “gateway” department for many reasons. Some people may take a job to get their foot in the door with a specific employer. Others may find a job in custodial because they are new to the U.S. and speak little English. Someone might take a job in a custodial department at a college or university to help get tuition reimbursement for a child or family member. Add to this the fact that custodial work is extremely tough with little recognition, so job satisfaction is low. According to the HBR article, this condition isn’t isolated to the facility management industry. Authors cite a study that found 70 percent of employees across several industries reported are dissatisfied with the career opportunities available to them — a key driver for retention and engagement. Further, 75 percent of employers said they expect to face a shortage of qualifications and skills from employees. Authors suggest that rather than looking at a “career path,” we need to change the way we look at a more growth-based framework. 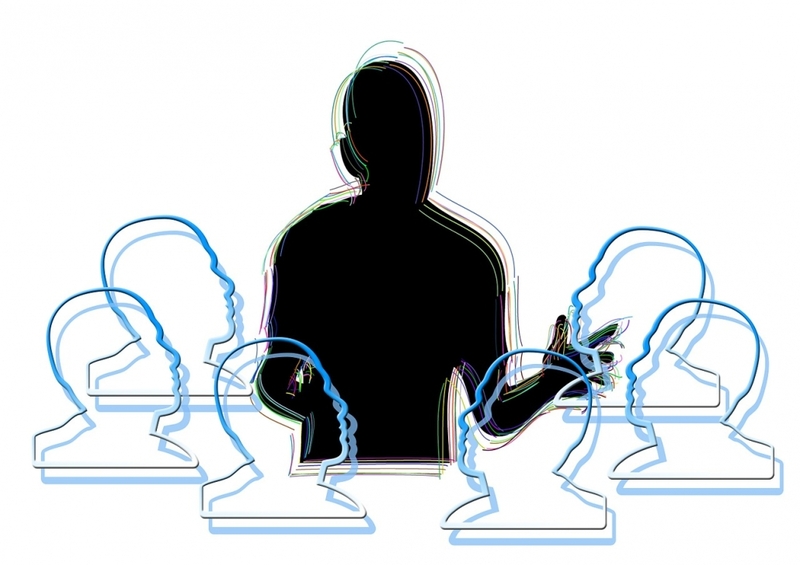 When mentoring an employee, the inevitable question we most often default to is “what are your career goals?” Rather than having a person focus on rungs on a ladder — for example, becoming a supervisor or assistant director—ask questions about the nature of the work, such as “what types of work do you want to do less of and more of?” And, “What strengths do you have that you can build on?” This helps employees thing more critically about their responsibilities and personal growth potential. 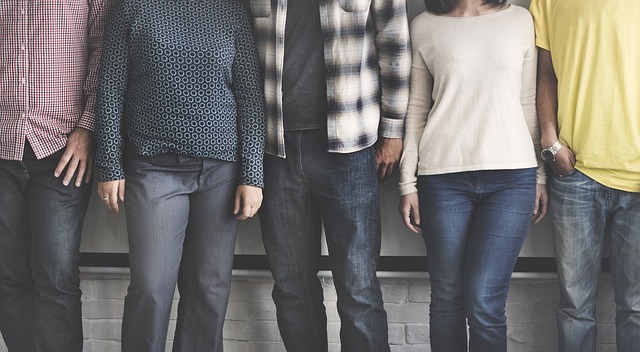 The article’s authors also suggest “focusing on transferable skills.” By empowering employees to “diversify their career capital” and think about a variety of transferable skills, such as communication, public speaking, management, etc., we help them find ways to grow personally and professionally. Within the (OS1) System, we have a language we call “OS1ian” that offers non-English speakers a fundamental set of vocabulary words they can use within the custodial operations, but also will be helpful for them in other areas of life. In a mentorship dynamic, you might ask someone what type of skills they would like to build upon to become more effective in their current position or what skill gaps they feel are holding them back? Authors suggest we “create milestones” to acknowledge growth and achievements, because titles no longer represent advancement. Training is such a critical part of what we do, so think about how your training program is structured to recognize achievement. Incentivize employees to accomplish a new set of milestones, such as a learning track in ergonomics or blood borne pathogens. This provides them with useful skills that empowers them, while also enabling them to grow professionally. By the nature of the work, custodial departments will prevail as the “gateway” department for labor. But this uniquely positions custodial managers to help employees not only shape their futures, but form critical skills that will help them along the way — in custodial in beyond. As we wind down an amazing whirlwind of a year, we’d first like to thank you for taking the time to read our musings on cleaning. 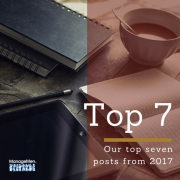 We’re almost a year into this blogging thing and have learned so much about what you want to read, how you read it and ways we we can continue to deliver great information to help improve the way you look at and manage your custodial departments. Earlier this month, we also launched the first issue of “Cleaning Matters,” a monthly electronic newsletter with best practices related to cleaning management and information to keep you updated about what’s happening in our world. If you didn’t receive a copy of it and would like to subscribe, please click here. Let’s Take a Minute to Thank a Cleaner: Our tribute to the hardworking people who work when most others are sleeping, cleaning the buildings where we live, work, learn, heal and play. What Happens When People Walk into a Building and See Dirt: A study found that 99 percent of people would have a negative perception of a business that wasn’t clean. When it comes to repeat customers, it turns out that appearance really matters. Think “Janitor” Is a Dirty Word? 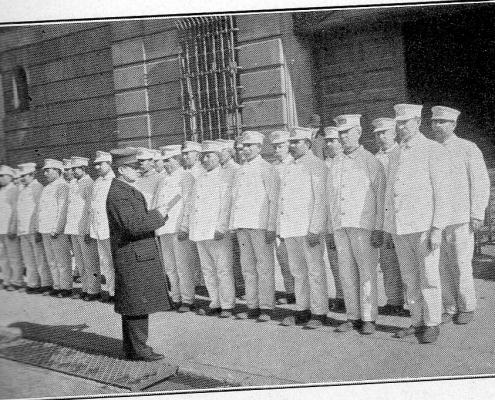 No, and Here’s Why: In this post, we dive into the origins of the word “janitor” and look at the profession of cleaning around the world. The Problem with the Way We’re Training Custodial Workers Today: Too often, custodial workers are handed a mop and told to clean without much additional instruction. 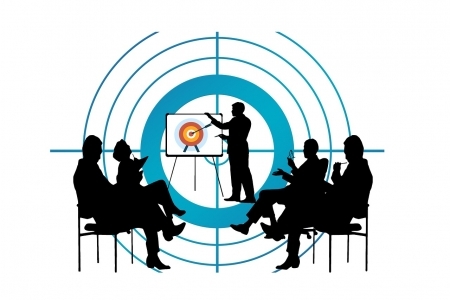 We look into why that approach can yield big issues for a business. Provo City Schools – Part I: What is “Clean,” Anyway? 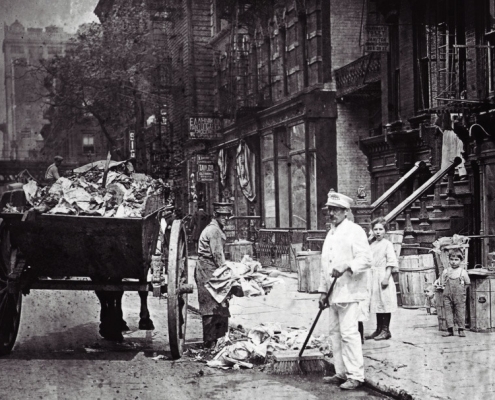 We examine Dr. Jeffrey Campbell’s ground-breaking study on the impact of cleaning on public health in a three-part series; Part I looks at how we define cleanliness. A Look at Restrooms Around the World on World Toilet Day: From bayakou in Haiti to tsukaiyausa in Japan, a glimpse at restrooms and sanitation around the world. How You Can Use Data to Reduce the Threat of Outsourcing: How to get the data you need to prevent your custodial department from being outsourced. Again, thank you for your support over the past year. We have some incredible things planned for 2018 and are so excited to have you along for this journey. If you have a topic you’d like to learn more about in the coming months, let us know and we’ll put it on the schedule! That’s us right now, coming off a high from one of the best weeks of Janitor University (JU) in its almost 25-year history. We had the largest class in several years, with a diverse group of attendees joining us from academia, government agencies, laboratories and building service contractors. Some attendees were taking refresher courses to earn their masters or professor certificates, but we also hosted a lot newcomers to the class. Why is this exciting? 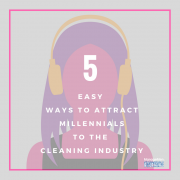 Because it tells us that many professionals are interested in learning how to manage cleaning in a way that promotes a healthy indoor environment rather than polluting the indoors by spreading around dirt through ineffective products and practices. 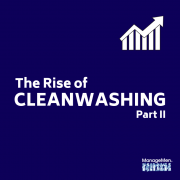 As students get settled in on the first day, we talk through the current issues in the industry and why a standardized approach to cleaning is so important. 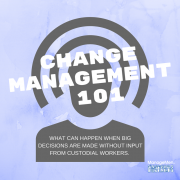 Since we’re regularly out in the field working one-on-one with managers, janitors and custodians, we have a lot of great images and stories that bring these points to life. The most important lesson during the first day of class is the stigma attached to cleaning and how we need to work in a way that brings professionalism to the industry and pride to the individuals performing the work. tThe first day of this course sets up the next day where we defined what a high performance cleaning system looks like. 1) Daily kitting and how to monitor the amount of solution and product used by custodial workers. 2) Tracking communication for complaints, requests, mistakes and compliments. 3) Practical tracking of equipment use in order to plan for preventative maintenance. Another great piece students to JU enjoy is the work loading exercise. 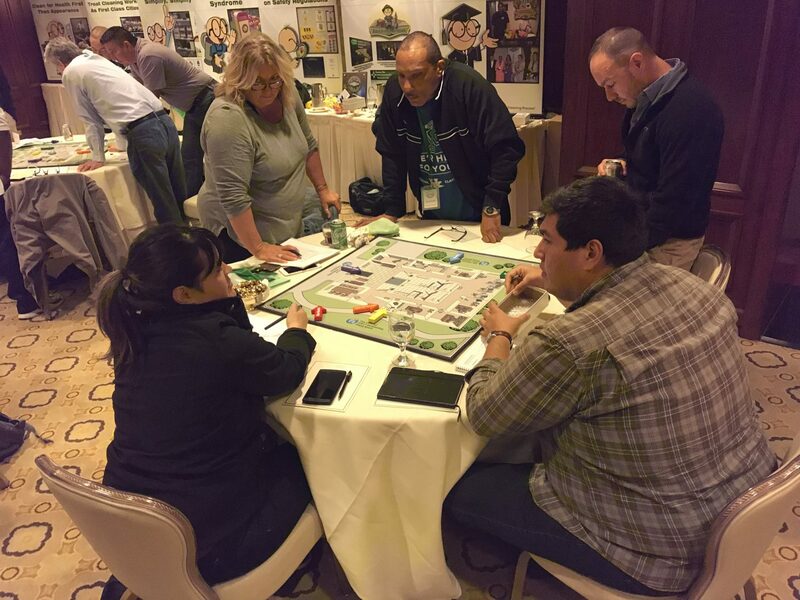 Recognizing that most cleaning professionals can’t agree on a common-set of work loading terms, we distill the components into a game to help simplify the principles behind work loading. Because, simplification! 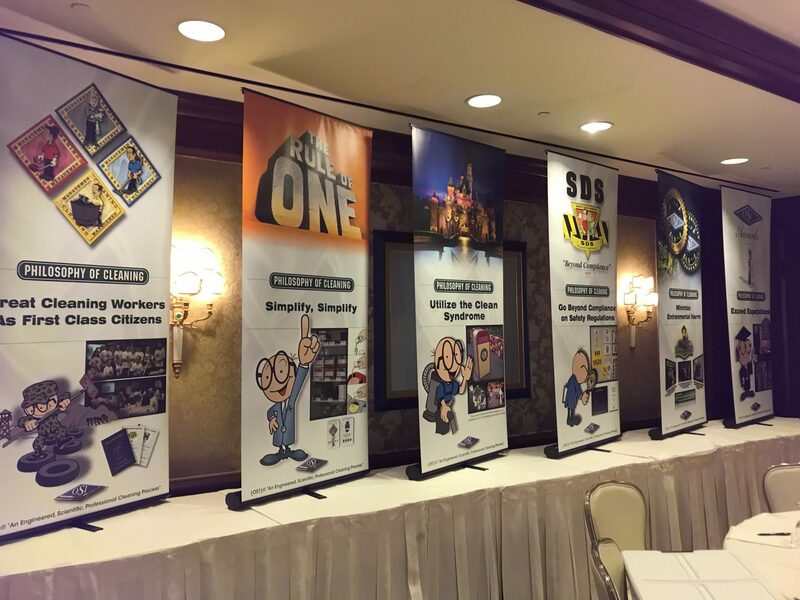 Beyond all the knowledge and education, attendees also benefit from the networking that happens during the event. 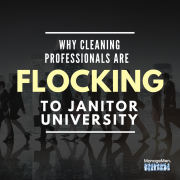 We regularly hear stories from people who develop professional contacts and friendships that last long after Janitor University is over. All attendees are encouraged to sign up for the class at least once every three years, because we’re regularly updating the curriculum so it reflects the current recommended best practices for cleaning. Albert Einstein once said, “The measure of intelligence is the ability to change.” As an industry, we have to get smarter and change the way we’re cleaning our buildings. If the students to last week’s JU are any indication, we’re on the way. 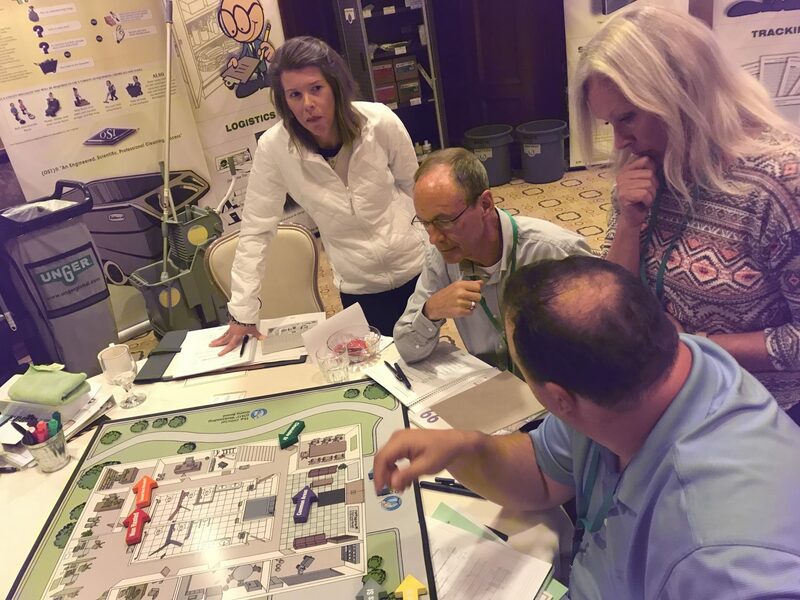 We’ve had more than 2,000 people complete the program over the years, and attendees regularly tell us that JU is the most comprehensive cleaning management curriculum they’ve seen. If you’re interested in participating in an upcoming Janitor University, stay tuned! We’ve got exciting news as we’ll be taking JU on the road in 2018. We are looking for more ways to enable cleaning professionals to participate in our courses, so we hope you’ll join us!